I have created custom aisles for WalMart and HEB. Each have their own aisle names. When I chose “list” on the top bar, then chose HEB on the drop down box. My HEB list pulls up. When I add an item (plus sign), in this case soup, it will put the soup into “Aisle 2: soup and crackers”. So far so good. Angie, thank you for your question. There are a couple of options you may want to consider. First, create List-specific Favorites, then add Soup item to both Favorites list and change aisle under each Favorite list. 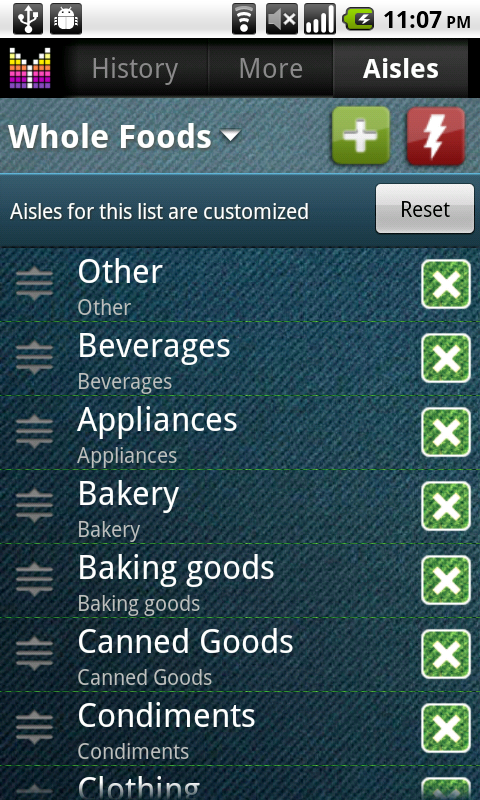 This will allow you adding items from Favorites list with correct aisle. Second option is having slightly different names for your “Soup” item such as “Soup A” and “Soup B”. Hopefully this helps. We plan a few modifications going forward which should help working with items in multiple stores. Suggestion on a future update? Maybe a “confirm delete”? I accidentally deleted an ENTIRE store’s customized aisles AND all the items IN those aisles…..whoops. All in all though, I just love this app. For the past 20 years or so I have been writing out my grocery list in the order of the store to save time from walking up and down every aisle looking for the items on my list. Which meant, the day BEFORE I went to the store I would have to sit down and write down the list in that order. NOW, not only do I NOT have to do that extra step, since I always have my phone on me (and hence my list) if I happen to be out and I’m by the store I can just pop in and not try to remember everything on my list which is still back at the house. Thanks for probably the all time best app out there. Angie, thanks for your response and your feedback! Glad to be helpful. As for delete confirmation — just use the Undo command (from Menu) to revert any accidental changes. Found the app last week and bought it for whole family. Still beleive it’s the best one outthere, but anyway getting started is a bit more challenging than intended. Perhaps an overview of the database structure (relations, tables links, etc.) could help to understand its behavior more easily than textual descriptions. As I stumbled over the same issue as Angie above: Can anyone explain me how to deal best with same items at different shops and their different prices? I also have customized aisle configurations for different stores. The main reason for that was to get the ability to store the same product for different stores, each at their own price. This way I wanted to be able to find out best price. Is there a better way to accomplish this? I also wanted to get the product with correct price and in the correct aisle, when I choose it from PickList via “+”-Button. Anyone in my area scanning for prices (ZIP D 75015)…? The standard Barcode Scanner seems to be a little bit low on data here. Rüdiger, I’d recommend creating list-specific favorites and add items with different prices into favorite lists. Just make sure they have the same name. This will allow you to see the best price of the item for your stores in Favorites and then add the one you’d like to buy into your shopping list. We also have plans to improve multi-store shopping going forward. Regarding aisles, I went into settings to customize my aisle list and it looks correct. Then when I go into my grocery list, chose an item and try to put it in an aisle, it brings up the original aisle list. Not the one I customized. Can you help me with this? Have tried many digital lists, but like this one the best. Is the “sorting within an aisle” option available yet? I really don’t use the bar-scanning or the coupons or anything, but sure would like to list items in order they appear in the aisle instead of alphabetically. Thanks. Cyn, thanks for your feedback! Unfortunately, sorting within aisle is not available yet. However, it is possible to change aisle order. For more details please see Manage aisles User’s Guide. There is such a thing as too many updates. I do not need a picture of my groceries but do need to be able to sort within the aisles as do many others. Was this included on this update? Cynthia, I’m sorry for keeping you waiting for the sorting within aisles feature. The feature is not available in version 2.1 which has just been published, but is planned for the next update. Thank you for your patience. I’m not sure if I’m using this right, but in my local supermarket the isles are numbered and many of them contain items from multiple categories (Each isle actually has 4 product descriptions). For example, isle 12 has milk and desserts on one side and sugar, flour and other items on the other. I tried setting up a parent isle just called “12” and then sub isles “Dairy” and “Sugar”, but when I tried setting the parent isle for each, it would only allow the parent 12 to have one sub isle assigned to it. Then when I add Milk, Sugar and Yoghurt to my shopping list it groups them under isle 12 for ease of shopping, but when I want to add a new item to the list, I can see where it needs to go without having to memorise the contents of each isle. Is this currently possible or could it be added? Hi Ed, thanks for contacting us. Unfortunately, in Mighty Grocery only one child per parent aisle is allowed in any given list. What you may want to do, is create generic parent aisles which include Dairy, Baking Products, Eggs, and Desserts. 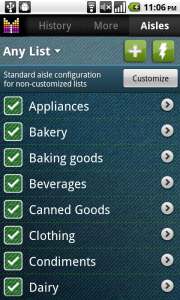 Then you could add customized aisles in your list and add aisle number in their name, i.e “12 Dairy”, “12 Baking Products”, etc. This way you could have different aisle configuration for other stores. May i reorder items in list like aisles, it will be useful! Hi Rik, thanks for your question. Unfortunately, it is not possible to reorder items manually, but we may consider this feature going forward. Thanks for the ability to change the names and order of the aisles as I shop in a military commissary and it is very different than a grocery store. Sometimes, I have to change the location of an aisle when I am shopping due to a reset of the store. On that note, please consider adding the ability to put items in a different order within the aisles. When I walk past the mustard, it would be nice to see the mustard on the list rather than the ketchup which comes first on the list, but is located on the end of the aisle. I know this is being picky, but it sure helps to get in and out faster. Hi Cynthia, thanks for your feedback. We will consider adding ability to sort items within aisles going forward. Is aisle sorting available on the new version downloaded today? Cynthia, unfortunately sorting items within aisle is unavailable in this release. It’s still under consideration. Thank you for understanding. Can we be allowed to create custom parent aisles? This is needed for true sorting for me but all I can do its make a regular aisle and its not available to be a parent aisle. Yes, it is possible to create a custom parent aisle. Just go to Menu –> Settings –> Aisles –> tap on the list selector on the top –> make sure “Any list” is selected. Now you can create aisles which will be available for selection as parent aisle. I use the full version and I am quite happy with it. I have feature wish, though: currently hiding an aisle does only remove the items from search and pick list; I would prefer if items of the master list would not show up in the sub-list, if the store of the sub-list does not contain the aisle at all. Thus I can enter all the things i need in the master-list, but the items do not clutter the lists of the sub-stores. Would that be possible? Hi Gerrit, thanks for your feedback and suggestion. This sounds like a good idea. Will consider adding this feature going forward if it won’t affect the app performance. I’m using pic2shop as my barcode reader because it doesn’t use auto-focus. How can I import the barcode from this app into mightygrocer. Hi Chuck, thank you for your question. Unfortunately, there is no way to import scanned items from the pic2shop app. 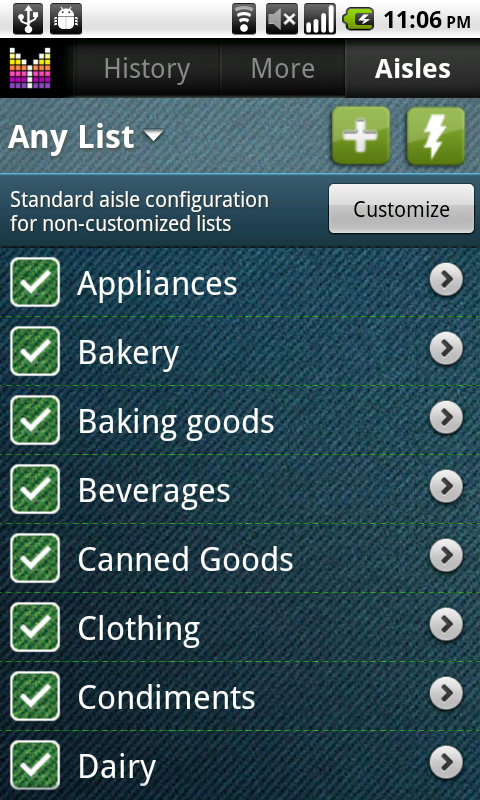 Only Barcode Scanner app is compatible with Mighty Grocery at the moment. Hi… I like and use your Mighty Grocery List Lite… The items are not organized by aisle, as they used to be before I upgraded. I really need this function, and I have looked up how to do the show/hide feature. What do I do if the items on my grocery lists are not organized by aisles, but when I check the settings the aisles are enabled to appear on the lists? Does this function work differently on the paid version? Thanks for your help. Hi Carol, thanks for your feedback and your question. 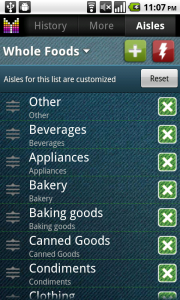 Most likely you need to set “Master list” setting OFF for your shopping list to make items grouped by aisles. Please see this Frequently Asked Question. Okay, I don’t think I’ve found the exact answer to my problem in your archives, so let me see if I am actually able to do what I want to do with this great little program. Unfortunately, the grocery store where I shop does not follow the “Groceries” list’s (Parent List) aisles at all. Therefore, whenever I add a product to my list named “Schnucks” (my grocery store), the products are listed all out of order from where they are in my store. I would like to be able to have the items I add to my “Schnucks” list be in the order they are at my grocery store; however, I would still like to have the items available from the “Groceries” pick list. Hopefully, you understand my problem and can offer me some suggestions. Barb, thanks for your question. Unfortunately, there is no the right way to do that until we allow assigning items to multiple store. As a workaround, you may want to create duplicated items for your Groceries store adding a tiny difference in details field of an item (details is a line #2 in item name).